The Bridges of Madison County: Film adaptations make great musicals. No wait, they're bad. The Bridges of Madison County opens with a solo. With the exception of Oklahoma!, musicals do not usually do well to begin with one actor singing alone onstage. The structure of musicals (which is surprisingly consistent among vastly different shows) tends to place a solo number as the second or third song, after we’ve had a chance to meet the main characters and become acquainted with the central backstory of the show. In this work, we are introduced at the start to Francesca, the Italian woman who left her home in Naples to become a housewife to Bud, an ex-soldier from rural Iowa. When we meet her family in the next scene – husband Bud and two teenage kids – we already know about Francesca’s journey to America and how, despite the years past, she doesn’t feel quite at home or quite herself. It isn’t a great dramatic set-up – in other words, there isn’t much at stake – but what it does is orient the story entirely from Francesca’s perspective. And it helps when that character is played by an actress as formidable as Kelli O’Hara. O’Hara is a director’s dream, as the show’s director, Bartlett Sher, would likely attest. (Sher directed her twice before, in South Pacific and A Light in the Piazza.) O’Hara simply illuminates the stage, due as much to her lovely, expansive voice and physical beauty as to an uncanny ability to radiate sincerity in every scene. There is nary an ironic or subversive note in O’Hara’s performances, which makes her a near perfect choice for the veritable tear-jerker that is Madison County. When The Bridges of Madison County was published as a novel in 1992, it ignited a passion in readers. Its popularity might be compared to the current captivation with Fifty Shades of Grey, except that Madison County offered a fantasy beyond sexual abandon. Deep, soul-reaching love is just as much the source of passion for its lovers. [After writing this, I noticed that Ben Brantley made the same analogy in his review. Either we’re thinking similarly, or it’s an obvious comparison.] The central relationship in Madison County is between Francesca and a handsome photographer named Robert Kincaid who visits Madison County on an assignment to photograph the area’s historic covered bridges. An immediate spark ignites between them and they begin a brief but intense relationship while Bud and the kids are away at a state fair. A movie adaptation in 1995, starring Meryl Streep and Clint Eastwood, was also a huge hit, and it’s not surprising that the next incarnation would be a musical. The grand emotional scale is just right for the heightened form of musicals, not to mention that nowadays every Hollywood production company has a Broadway division, eager to adapt the next high-grossing film. The Broadway production of Madison County, which ran last summer at Williamstown Theatre Festival, features a score by Jason Robert Brown and a book by Marsha Norman, each a seasoned musical writer. In their partnership, those grand emotions that made the novel and film memorable transfer believably through song and dialogue. 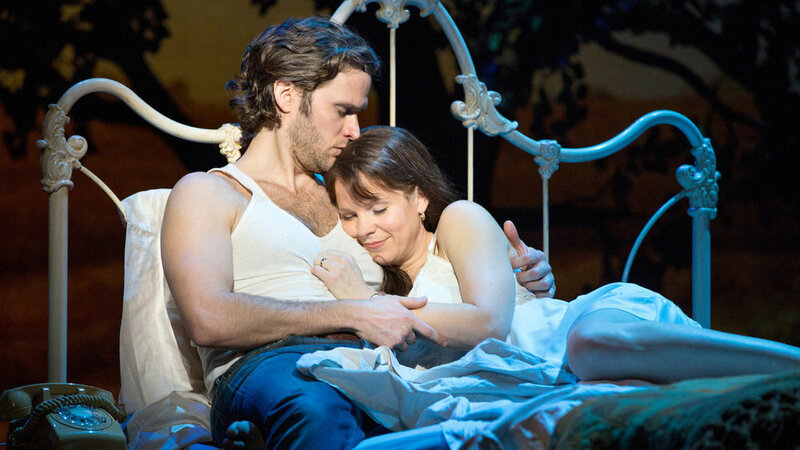 Steven Pasquale, imbued with a powerful singing voice and chiseled bone structure, stars as Robert, ensuring that Francesca’s reasons for having an extra-marital affair are well understood if not justified. Pasquale and O’Hara collaborated previously (on the musical Far From Heaven) and their onstage chemistry is authentic and palpable. All of these elements work together and convey a heartfelt love story where it could easily have been contrived or saccharine. The show also finds room for laughs, very much needed in a work this heart-tugging. One comic moment happens early on in a frenetic family scene. As Bud and the kids get ready to leave the house for their drive to the state fair, Bud spills a package of ice all over the floor. It happens suddenly, making me, and I imagine others in the audience, wonder if it had been an accident. A moment later, in sung conversation, Bud asks how Francesca will spend the upcoming days without him. Francesca mentions a few things, then adds, “Or I might spend three days cleaning up this ice.” Staged, indeed, but delivered cleverly toward a joke. The line also indicates how resigned Francesca has become to a life of housework. The balance of humor to gravitas owes much to Director Bartlett Sher who does impressive work here. His last Broadway production was Golden Boy, Clifford Odets' beautiful and underrated play about an Italian-American teenager who trades in his violin for boxing gloves. Sher is a master at creating a swell of emotion onstage. Bridges could easily be a schmaltzy sap-fest. But it wasn't. The one change I’d suggest would be to shift the focus toward Robert. He is the traveler in search of purpose, and the experience of meeting Francesca is life-changing for him. Francesca, by contrast, has a rather complete life already – it may not be passion-filled, but it does include a husband and two children who love her. There was much to enjoy and even love about this production, and yet, I left the theater wondering, "Why was this made into a musical?" The fact remains that if you put a talented composer, writer, director, and pair of actors in a room together, they'll likely emerge with something beautiful. But there's something about adapting a major motion picture that feels so unnecessary, so redundant. Unless, of course, the vision is vastly different in its use of theatricality. Adaptations of novels are quite different, partly because fewer people read books than see movies, but also because the experience of reading is private and quiet; a staged performance therefore has the opportunity to offer a live interpretation of the written word. In Fun Home, Alison Bechdel's graphic memoir that found its musical incarnation at the Public Theater this year, the creative team of Janeane Tesori, Lisa Kron, and Sam Gold envisioned a musical that held the emotional core of the book while depicting the narrative in a completely original way. Adaptations have for decades been a life force in theater. In fact, most of the long-running, influential Broadway shows have been adaptations, from Cats to Fiddler on the Roof to RENT. But the Hollywood takeover of Broadway has made adaptations – particularly of movies – the norm, unintentionally crowding out new work. Brian Yorkey and Tom Kitt are about to debut their second original musical, If/Then, following the success of their first (the Pulitzer-Prize winning Next to Normal). Kitt and Yorkey prove that audiences will embrace new work if the talent is there. Marsha Norman has all but rejected new musicals, asserting that audiences want something they already know. I'll admit that a recognizable movie title may be an easier sell, but I think audiences are just as on board for a great story with beautiful music. Jason Robert Brown does deliver on that front. His powerful duet “One Second and Million Miles” feels as emotionally riveted as the final song of his previous work, The Last Five Years, “Goodbye Until Tomorrow”. His composing talent is undeniable as is his ability to write new musicals. There's no argument that films are great and that some musicals adapted from films are beautiful. But they're overwhelming Broadway. There are great composer and lyricists writing new work right now if we look past the dizzying list of musicals lifted from films we already know.